I am not one of those bloggers who do a favourites post every month. I usually use the same stuff, so it would be quite boring to read for you guys. 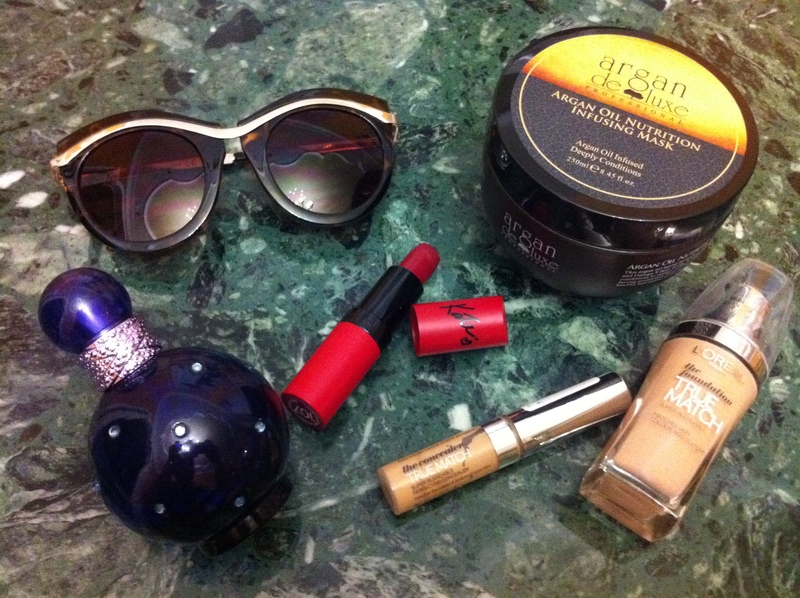 But during October I’ve been trying out some new products and some of them are pretty amazing. Next – my favourite perfume for Fall. I have never included a perfume into my favourites post as far as I remember, but since I’ve been using Midnight Fantasy by Britney Spears non-stop during October, I thought I’d mention it. I got it a while ago in Bangkok airport, mine is a 50 ml bottle that has one third of it left now. It’s a sweet but not too overwhelming scent. I know that most people use it in the evining but for me it’s a 24h perfume that is very feminine. I am not very good at describing perfumes, but if you like sweet and quite deep scents, definitely try it out. Argan Oil Nutrition Infusing Mask by Argan Deluxe is something I have been raving about for a while. Great product for split and dry ends. I have done a separate review on this hair treatment so I am just going to say that it is my all-time favourite mask that makes my hair healthy, shiny and more voluminous. Going to my makeup favourites, I’d like to mention a product that I’ve talked about in my previous posts – Rimmel’s Kate Matte Lipstick in 107. Perfect burgundy shade, that doesn’t smudge (for more details check out my previous posts). And finally, my two last makeup products that I adore, both by L’oreal – True Match foundation and concealer. I have ever used. It’s better than some high-end ones even. It’s not too cakey, blendable and feels light on my skin, but also gives me a decent amount of coverage. It really does kind of adapt to your skin, which I love. Great for normal to combination skin. My last favourite is True Match concealer. I received it as a present from my aunt. Mine is in the shade ‘3 Cream’ and it’s a very neutral beige color with yellow undertones. When I started using it in August I was very tan and it worked perfect, and now when I am quite pale I still use it and it doesn’t look dark at all. So it adapts to your skin too, just as the foundation. It has quite thick and dry consistency, so I definitely recommend it for concealing blemishes and any kind of redness, but not under eye circles. Overall, the best concealer I have ever tried, will definitely repurchase it.